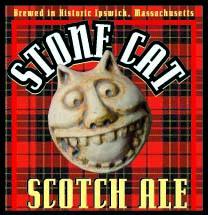 The Stone Cat Scotch Ale pours a dark amber hue with a fizzy, off-white small head with pretty weak retention. Lacing is fairly good though, as the rings of lacing are fairly substantial. The nose reveals a sweet malt aroma with hints of sugar candy, and the alcohol punches through and makes itself known. First impression of the taste is the malts, that provide a light sweet upfront flavor, ramping up to a moderately sweet finish with an alcohol sting that gives a bit of a kick. Light to medium bodied, it has an almost creamy texture, but mostly oily, that coats the back of the throat, along with an alcohol finish. Reviewed on January 3rd, 2008.